This summer I had a some vegan clients. I often get vegetarian or pescatarian clients and people with gluten intolerances, however veganism is rarer and a more complex challenge for me, especially living in the Corbières where getting vegan friendly products is nigh on impossible. When I look for replacements I am looking for the same flavour/texture and wine matching experience as the rest of the group are experiencing, hence it being more of a challenge than just providing a vegan alternative. I should note though when I say products I am really talking cheese, as obviously we have a wealth of fruit and vegetables, fantastic grains and dried legumes! Cheese is the sticker, it is impossible to get. I finally tracked down some revolting, processed slices in an organic shop but there was no way I was going to serve them that, so I needed to make my own! The goat’s cheese replacements were fairly easy to make and I will post those recipes later. The real challenge however was blue cheese, how to get that salty, umami flavour without spending a fortune (and months) on special yeast cultures that I needed to send away for and prepare months in advance. There were only two vegans after all! 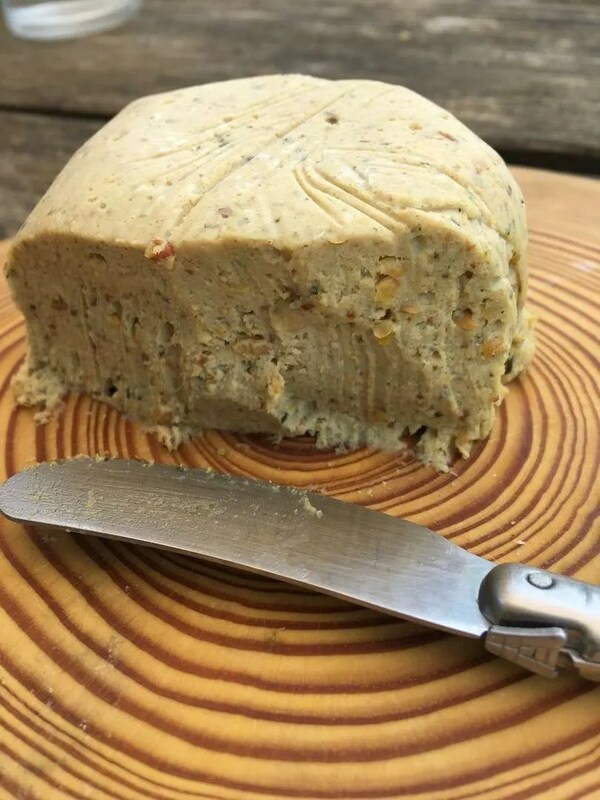 So below is my version, I adapted this recipe from the LowCarb Vegan blog, and whilst I don’t believe that it would fool anyone into thinking it was the real thing, it was very tasty and had the exact flavour I was looking for. Put the seeds and all other ingredients (except the tofu and coconut oil) into a food processor and pulse until you achieve a smooth paste. Cut the tofu into slices and squeeze out any juices in a clean tea towel. Melt the coconut oil over a gentle heat to liquify. I did this in summer and it was so hot that the coconut oil was already liquid! Add the tofu and the coconut oil to the processor and mix until homogenous. Taste the cheese, you can adjust the flavouring by adding more yeast, salt or/and garlic at this point. The flavours will mellow with time so bear that in mind when tasting. Put into a cheese cloth, or muslin, lined dish. I made three 200g ramequins with the above quantities. Wrap with the cloth and then in foil and put into the fridge to mature for at least 24 hours but up to a week. You can freeze the cheese. I served this with the Domaine des Soulanes Maury 2016. A Vins Doux Naturel made from the Grenache grape. The sweetness in the wine cuts through the saltiness in a way that a dry wine cannot. In fact dry wines clash with salty blue cheeses and the result is a wine stripped of it is fruit flavour and a cardboard like taste! Domaine des Soulanes is owned by Cathy and Daniel Lafitte, an organic domaine with fantastic, handcrafted wines. This wine works equally well with rich chocolate desserts. During my tasting I served it with the blue cheese and some Petit Pots au Chocolats, made with soya cream instead of traditional cream – nobody noticed the difference!